Ladies and gentlemans! This is not an April joke! Let me announce the 8th edition of the Räbinä Awards, for 2015! It's an honour to be the opening MC and I can assure everyone of you that even though we have a rough year behind our back, this gala is no less than the previous ones. So let me advice you to make yourself comfortable, place your fingers on the F5 button on your keyboard or use your big hd televisions with your smartphones to enjoy browsing through the Räbinä Awards 2015 Gala thread! I want to greet the new members and welcome back the old ones! As the years passed and I now find myself to be back here I realized I will be playing GeneRally in the far future as well. Just consider that I'm not the oldest community member here with my ~33 years. Some of you will defienetly be playing Dark Souls 3 for a few months when it comes out or bullying other players in some MOBA or MMO for a year. But I can garantee that there will be players who will still be playing GeneRally near their sixties. Enjoy the show, the commercials! And congratulate our members even if they aren't the ones who go home with a fine piece of gold in their hand! Every contestants matter! Even you! Always sign your every work in GR! Or use .txt files to inform us about ownership! Last edited by Garbre on Wed Apr 06, 2016 3:43 pm, edited 3 times in total. AeroWiewiur, Gzehoo, Herbal, Lorenzo, Marcinho, masa, puttz, Ryumi, sartalas, Trigger Happy. And after cars... it's the turn of the tracks! Just like when you want to make a race on Generally, you open Your GR application, you choose the cars you want to use (it's better to give slower cars to AI hehe) but then? You have to select a track, but which track? one from the "Old tracks" folder? ...so one from the "World Tour Tracks" folder? ...what about the only-TE-tracks you've made? So what? We will be completely hopeless, but luckily it's not like that thanks to our skilled Trackmakers and their incredible creations stored here in the forum. We surely have enjoyed many tracks released on 2015, a clear sign of the their high quality is that Trackmaking is the category with the highest number of nominations on this edition of Räbinä Awards. AeroWiewiur, Bouncebackability, CamrosX, Dragon, Emil Patanen, G. Marques, J.J., Kengp, Maciej1, marinator, masa, sartalas, spacethingy, Szmajli, TuomoH, Wojtek, Zegarekr. Who is this Zegarekr everybody is talking about? GeneRally has no online or network multiplayer - and yet there are a lot of people playing this game online! Seems crazy right? And that's not enough. They are organizing competitions - not just only one but quite a few of them. All with different rules and ranking systems. And they are creating lovely websites and graphics for these competitions. And there are still new ideas to explore after all this years! It’s just amazing to see all this happen. The competitions are one important part of GeneRallys community and definitely one that helps keeping the game alive. It´s a pleasure for me to present you the Nominees for the Competition Organizer! Thanks to all of you and may the 40 Polygons be with you within the next year! Areen, Buka, FrukisCZE, Gzehoo, ivaneurope, kuba, Mad Dan, Marcinho, PGRF1 team, puttz, RobertRacer, zgr. Wow, a lot of variety in the votes in this category. Lots of good organizers here. Lol! My hunch was right about the trackmaker! Your neverending productivity always amazes me! How can you still make tracks with the same brilliance after all these years?! It's crazy, but at least you are the example that it's not impossible. Well deserved! Congrats to the PGR F1 team and Lorenzo! When I joined this Generally forum, I had never knew that one day I would be a presenter for the most prestigious event in our Generally community, the Räbinä Awards. So I thank the organisers for this oportunity. Now, the Commentator of the year – I guess to some this nomination may seem not as important as trackmaker, carmaker and etc. But a good carmaker will try to win the award by making cars, and a good trackmaker will try to win the award by making tracks. But to win this award, you can not try, because when you are commenting you are not thinking about a reward. You see to be a simple commentator, it doesn't take a lot of skill, you simply need to know the basics about tracks, cars or whatever you are commenting on. However, this award isn't going to a simple commentator, it goes to a person, who knows much more about Generally than the basics. This award will go to someone, who doesn‘t mind losing a bit of his or hers life to write a review of someone elses work. So without further ado, here are the nominees for Commentator of the Year 2015.
bif44, Black Rebel, Emil Patanen, marinator, Rendy, RobertRacer, Trigger Happy. And of course, I would like congratulate to all of those, who have received an award! GeneRally. The game we all love. Great tracks, great cars ("Real men drive 40 polygons.") and many wonderful guys who keep this alive. Guys like Trigger Happy, Buka, Jo.sk, Maciej1 and more you all recognize. But everyone started as a rookie. Some start their career as trackmaker, some as carmaker, as competition driver or in an other way. I remember when I was a rookie back in 2010. I joined the community and found all the wonderful tracks, cars, etc. Over 1300 posts later I see new member join and post wonderful tracks, chating with GRIF members...and this things make me smile . Now, I want to thank you, "rookies". Without rookies our great community wouldn't be the community we know right now. New tracks, new cars, new competitions and very friendly new friends. But there can be only one Rookie othe Year 2015, so let's see who it is! BlacMky, K5054, Kengp, minuseven, superiukas. Also congrats to all winners! (and sorry if I'm a little bit late ) ! 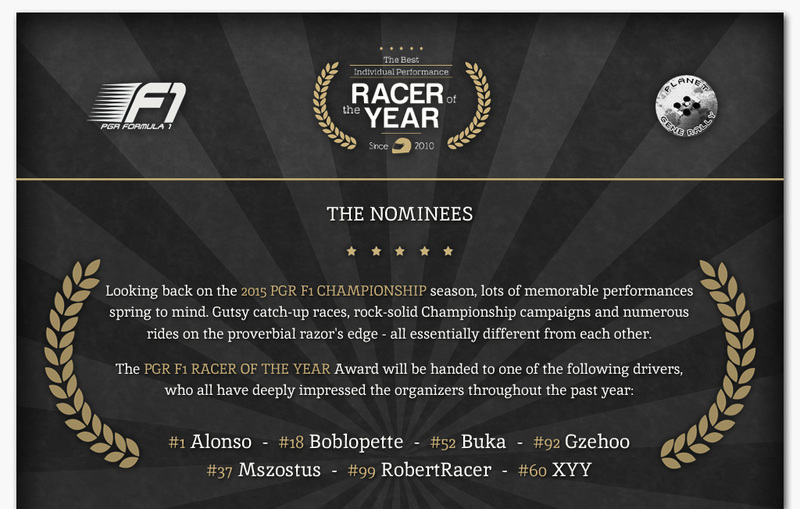 Once again, I have the pleasure to present the "Racer of the Year". This year we have a new winner, the 9th different driver after Soltys, MagicJ, Jo.sk, JR Zullo, Alx.it, Alexwolf79, TuomoH and Alonso. He's started his career almost 9 years ago and became better and better until now. His main opponent was again kuba who miss the victory and finish second for the the 3rd year in a row. Last year he also won 63 events on 87 and more major events than kuba, it's why he deserves the victory ! All the drivers who took part in 2015 ! And obviously congratulations to the other winners ! I didn't expected to win this category for the 2nd time, but I gladfully accept the price for best commentator 2015. Also, congratulations on all other winners. Now after we're past the most of envelopes, let us present the awards, which were not elected by the members of the forum, since honorary awards are given by the Comittee of Räbinä Awards. There are two of them, one is given to an active member, while the other is for someone, whose work still affects our everyday life. The honorary award is given this year to someone, who joined us six years ago. Since then, he has released us first several tracks. However we know him not from these. The winner of this award is a keen and regular racer, with taking part in more than 500 races. His own racing team, Lambda Motorsport has become one of the most successful brand in our little game. He also is an actual contestant in my opinion for the carmaster rank. There, his interest is more for GT category, but the own marque models are also high quality. The most admirable work he has done are his championships, since Grand Tour Trophy has become prestigious: currently it is having its sixth season, with the first one being started back in 2011! His other competition, International Endurance Series is also prolific, making it unique for the latest years. Last edited by Herbal on Mon Apr 04, 2016 8:13 pm, edited 1 time in total. Wow, I'm really surprised I started to laugh from happiness when I was reading another lines in Herbal's post. I never expected that Honorary Award would come to me. But it's a great honor to me. So, only Community Member is missing. Congrats Gzehoo, you earned it . Honorary Award in Memoriam is my most favorite and less favorite of all awards. It's the possibility to remind the community about the people who did so much for the game. And that's the saddest part of this award also, because they don't do it anymore. Mebiko, Soltys, Juan, Raska, James C. (the good James, as I think of him, in contrary to the evil one who put GR on the brink of extinction), Strava, Reh... This year the award goes in my opinion to one of the most respected and reputable member of the good old RSC-era when grass was greener and some of us were kids. The guy's the author of a hundred great tracks. He was BBA's predecessor in Joint Effort Track project. He was one of our moderators. Oh, yes, and he's heavy metal fan as far as I remember. We want to thank all our voters and all the great competition organizers out there for your dedication to our little game. It is a great honor to receive the Räbinä Award for the second time after 2011. We are trying our best to improve the PGR F1 experience for the coming season as early as we have got time in our hands. And if you still haven't got enough of prizes and awards, take a look at the PGR F1 RACER OF THE YEAR Award. Some of the driver portraits even got some quick but fancy CSS-animations! Or you just might just want to read the winner's resume. Last edited by RudyOosterndijk on Tue Apr 05, 2016 4:00 pm, edited 1 time in total. First, sorry for my english. Community member - last on this gala and IMO most valuable award. This prize goes to person who is the most popular and most friendly for all members. I think that every member may win this category but Golden Rabina is only one. Keep it up. Congrats to all winners, especially to Gzehoo. Thanks for all nominations, votes and Herbal for organization this Gala. Let's go to results. Bouncebackability, Buka, Gzehoo, Haruna, Herbal, Marcinho, jo.sk, puttz, RobertRacer, Trigger Happy, TuomoH. 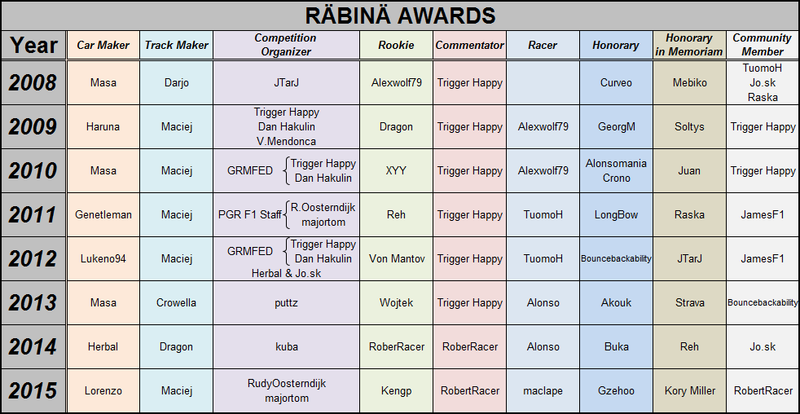 Congratulation to all winners of this Räbinä Awards. The title hat-trick for Caterham-Windblitz Motorsports is complete. And Community Member, idk why I got CM of 2015. I didn't did more than 2014, where I not won. Jo.sk or BBA would have deserved it more. I belive in it. But still, thank you on both occasions, and on Commentator award, for voting for me. You are the real MVPs, voters. Congratulations to all the winners, each trophy was well deserved.